Welcome to the Haydock Park Greenkeepers Blog, it is hoped that the information on this site will give you a better understanding of the works that are carried out by the greenkeeping team throughout the year. Our winter programme has covered various projects, the pictures below will show some of the work that has been carried out. The blog in March will highlight the work undertaken on tree management, course aeration, bunker design and reshaping part of the 3rd green. 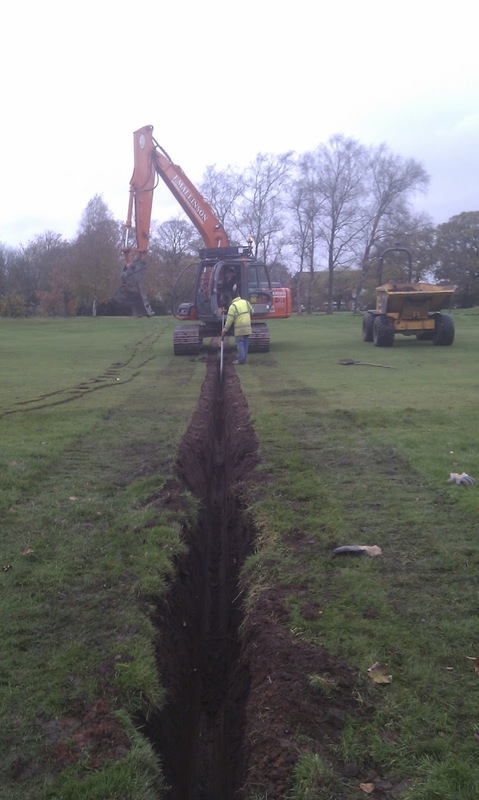 Drainage work has featured heavily over the winter period due to the unprecedented amounts of rainfall over the past few years. 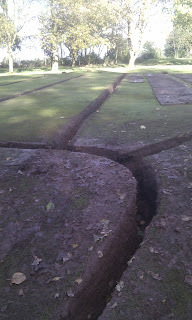 Large areas of drainage have been installed by contractors Mallinsons, smaller areas of work were undertaken in house. The picture on the left shows work carried out by contractors Mallinsons on the 3rd /5th holes, the length of the pipe work installed was 155 meters.They also drained behind the 12th green / 13th tee. The picture to the right shows drainage work undertaken by our own staff at the side of the 14th green. 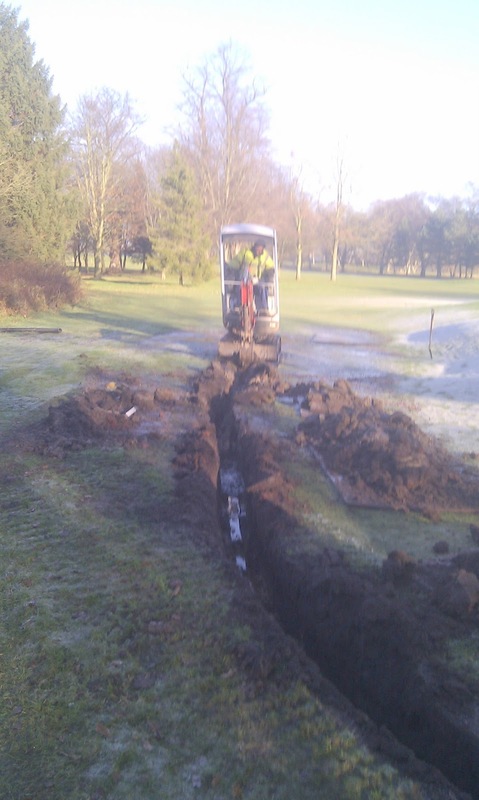 Problem areas on the 1st/ 3rd/ 14th/ 15th and 16th have been drained as part of our winter programme. The 12th green has been re drained, it was felt that after re-contour work, deeper aeration, the drain cleaned and part renewed in 2011, that the green did not drain adequately due to a heavy clay profile. The whole green was re drained by our own staff. The picture below shows the mini digger digging out the lateral drains to link up to the main drain and outlet, Daniel Gildea can be seen checking the levels. The green was drained with six laterals at three meter spacings in to the main at a depth of around 600mm, the lateral pipe was 80mm diameter in to the main at 100mm diameter. 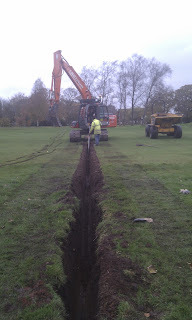 The drainage stone was 6mm-10mm which covered the pipe up to 300mm topped off with rootzone, firmed and returfed. 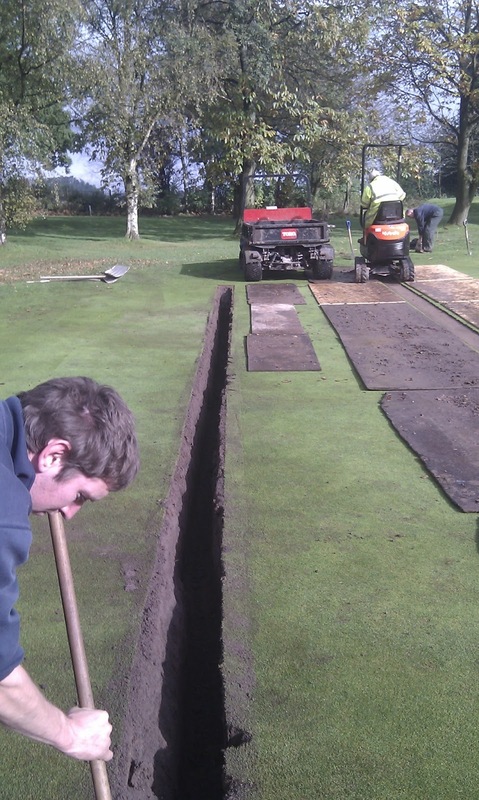 The picture on the right shows the net work of laterals joining up to the main, notice the boards on the green to reduce any additional surface damage.When the pipe work, stone, and rootzone have been put in place it is critical to try and lay the turf back down to allow for it to settle yet not too high that it may be scalped by the cutting cylinders in the spring when the grass begins to grow. 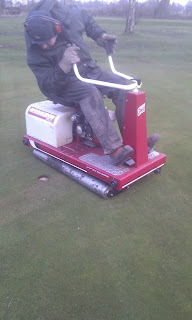 The photo shows deputy Head greenkeeper Dave Traynor using the turf iron to obtain good surface levels on the green, after the turf had been allowed to settle throughout the winter months. To enable us to achieve desirable surface levels regular top dressings will be applied to smooth out any hollows or bumps, along side sensible cutting heights and favourable weather conditions. Lets hope that by the time you read the next blog in March there will have been a prolonged spell of dry weather !!!!!! I hope this information has been interesting and will show an insight in to our work in managing and maintaining the golf course.